How often have you visited a website and backed out within just a few seconds? What are the odds that your potential customers are doing the same on your website? Many small businesses are missing opportunities by making it cumbersome for their audience to engage with them online. Thankfully, some of the most common flaws of small business websites are also among the easiest to fix. Ask these three quick questions to help improve the focus and results of your small business website. 1. Is Your Message Simple and Relevant? Website visitors quickly scan a web page before they engage in a deeper site visit. It’s essential that visitors to your website quickly understand who you are, what you do, and where they can click for answers to their questions. If they don’t make a meaningful connection with your website in about five seconds, it’s highly likely that their next click will be the “back” button taking them off of your website. Here’s a simple test. Look at the most prominently displayed headline on your home page. Jot it down and ask someone outside of your business to read it. Does this phrase alone give them a clear indication of what your company does, or is it just a generic marketing statement? Refine your opening content to quickly answer the “what we do” question. 2. Is Your Navigation Intuitive? 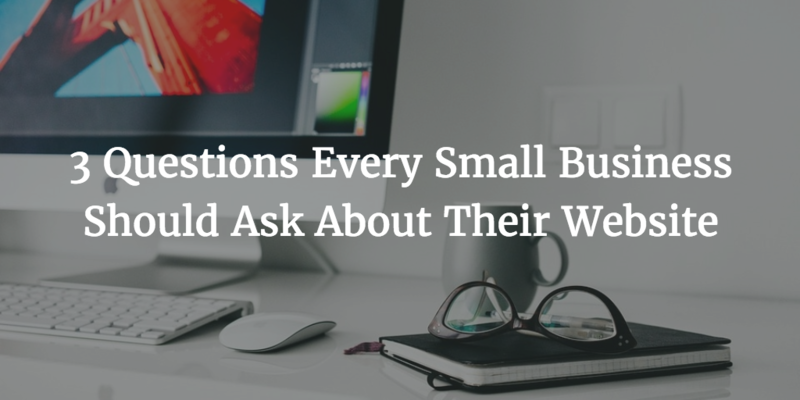 Every potential customer visiting your website has a question (or multiple questions). The success of your website hinges on connecting them with answers. Look at your website’s primary navigation elements from the user’s point of view. Would they immediately know where to click to find the information they’re looking for? Use simple, clear navigation in a consistent manner throughout your website. Find ways to improve the user experience of your site by asking for feedback from someone less familiar with your business. Ask them to interact with your website and accomplish key tasks. Observe them as they navigate your website and note where any points of confusion occur. 3. Are Your Calls to Action Clear? Avoid the temptation to provide too many calls to action on one page. Doing so can make the page busy and reduce its effectiveness. Focus on one or two relevant next steps based on the context of the page. Then, configure your web analytics to track how often users engage in these key actions. The underlying principle behind of each of these questions is adopting a user-first perspective for your website. By helping your audience quickly understand your website, intuitively find answers to their questions, and easily take a next step, you’ll be charting a course toward improved online success. Shane Fell is a digital marketing strategist, educator and public speaker. He is the co-founder of LimeGlow Design, a Milwaukee based marketing agency focused on providing affordable websites and creative services to small businesses. Looking for ideas to improve your website results? We'll review your site & send you a custom video evaluation with specific recommendations for your website. Quick, practical, and no strings attached.